Summer is the best part of the year – unless you run out of things to do halfway! The kids start getting cabin fever and turn to YOU for ideas. Well moms, I have a solution: the Lucky in Love Desert Shore Collection for you and the Shoreline Collection for your daughters. Get out and onto the court with your girls in the matching collections to spend quality summertime in the sun. To get her excited about the trip to the court dress your daughter in the Pleat Tennis Skort in White and Lagoon paired with the Shoreline Tennis Bralette in Lagoon. This look is cute and youthful and she’ll love it because of the energizing arrows made from the print in soft colors . This mostly white skort makes it extremely easy to mix and match her outfits, and it’s something she could potentially wear to school events. To spice up her outfit, the Shoreline Bralette is perfect for the job. It comes in a beachy pattern with matching tones that’ll stand out against her white skort. Lucky in Love will keep your little one cool with this tank’s top layer designed for maximum ventilation. If you love the Lagoon pattern and want to match your daughter then the Desert Shore Collection carries the Vitality Tennis Bralette Cami in Lagoon , below, and the Chill Tennis Tank in Lagoon. 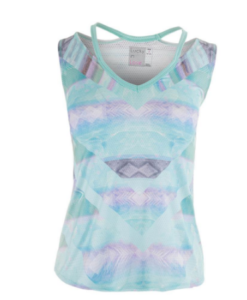 Both tanks will look great with any skin tone and have a more relaxed fit to flatter any body type. The Vitality Cami features a built-in bra with extra support, while keeping everything in place with elastic straps. 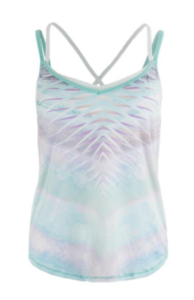 The lightweight top has mesh insets on the neckline to save you from chaffing. The Chill Tank focuses more on moisture management throughout the fabric, which allows for maximum ventilation the more you twist and turn swinging on court. Show your little girl how to dress with the fashionable dolphin hem and double straps that allow you to wear any sports bra you please. The Desert Shore Collection gives that enthusiastic energy by blending and mixing the bright blues. It’s especially seen in their spunky skorts and skirts. To match your little ones positive and upbeat vibes, show up to the court in the Zipline Tennis Skort or the Long Drop Pleat Tennis Skort. The styles are perfect for mothers and young women looking to find clothes that are modest and up-to-date with the latest fashion trends. 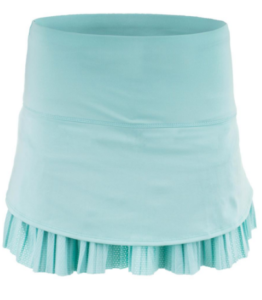 The Zipline Tennis Skort is a body skimming skort made with athletic material, polyester and Lycra, which allows you to move freely while getting low for the ball. The Long Drop Pleat Tennis Skort is my personal favorite with the thin pleats details peeping out from under the top layer. There is also a wide, elastic waistband to keep you from feeling restrained for a comfortable match. If you can’t wait to start showing your little one the ways of the court then shop Tennis Express and get your matching outfits ready now. Tag us on instagram or twitter to show us how well you both played in these lovely collections!